Time travel as a plot device either goes well or plunges into the depths of lazy writing. So many stories tend to bend over backwards in order to make time travel work, so much so that they become irritatingly confusing. Sometimes, it’s just nice to be able to sit down and play a game where you are tasked with going back in time to stop people from messing with history. The Journeyman Project series accomplished this not once, but three times, finding new ways to make the formula work. This has to be the early-90's-ist cover art I’ve ever seen. 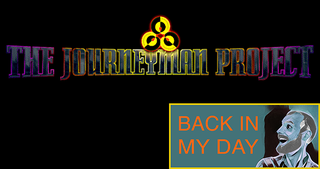 The Journeyman Project series takes place in the 24th century, where a myriad of technological advancements have granted humanity the ability to warp spacetime, allowing the possibility of time travel. The main character is Agent 5, a member of an organization known as the Temporal Security Agency (TSA), which is tasked with ensuring that time isn’t tampered. On the day that we as a species are to be admitted into an extraterrestrial organization of pacifist civilizations (the Symbiotry of Peaceful Beings), Agent 5 gets a warning while at his post that history has somehow been corrupted on three key dates. As he is the only one at the ready, Agent 5 must go back in time and make everything right. Most time travel games and stories focus on taking its audience to a time before our current time, like Elizabethan England, Tang-era China, or even the Jurassic period. 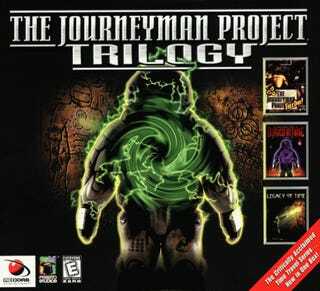 The first Journeyman Project, however, decided to send the player to three days that are in the past in the context of the game, but are in our future. This allowed the developers to fabricate levels that had futuristic, yet wildly different designs. Each locale’s design reflected its purpose; some were highly industrial and minimalistic, while others were more organic and brightly lit. Morimoto Mars Colony vs. The Sydney World Science Conference. They could also make up whatever they wanted in terms of where each level was located, what was happening at that point in history, and introduce characters that don’t have historical baggage. NORAD VI is a military station that is built deep in the middle of the South Pacific Ocean, the Morimoto Colony is on the Martian surface, and the World Science Conference is housed in an installation floating high above Sydney, Australia. This free rein made the time periods that the player visited vibrant and engaging (for early 90's graphics), and was a narrative breath of fresh air for the genre. In Buried In Time, you engage with the time-tested trope of going back into what we would call the past, travelling to historical places like Château Gaillard, Chichén Itzá, and Leonardo da Vinci’s workshop. This grounds the player in reality by having them explore real-life locations, and at times actually learning something about them in the process (that is if you bother to read any of the dossiers about these spots). While it locks down what the designers could create, as they had to keep a measure of authenticity for each locale, but they put a great deal of effort to make every level realistic and alluring. In the first game, Agent 5 saved history, but this sequel tasks the agent, who now has a name (Gage Blackwood), to prove his innocence after someone frames him with altering certain time periods for personal gain. This is a narrative shift for the series, pivoting the focus from safe-guarding all history to solving a centuries-spanning mystery. To hammer home this shift, your base of operations is not the TSA headquarters, but your future home (time travel is weird). You go through your personal belongings, examine interactive sculptures, even listen to/watch your voicemail with one of the creepiest devices I’ve ever seen. This is a far cry from the high security government complex where you worked in the last game, and it reminds you that you are fighting for yourself. Going from being a protector to a detective turns the game into a more intimate experience, and this intimacy is heightened when you recruit an A.I. partner, Arthur. Arthur is mainly there to provide comedic relief, as well as offer hints and clues for solving many of the puzzles found throughout the game, but having a companion offers a wildly different experience from the previous game. Instead of going at it alone, Arthur provides some measure of companionship while you’re trying to clear your name. Quick quips, one liners, and Monty Python references turn what would have been an average time travel plot into a delightful romp through history with your best artificial friend. So what do you, a game designer for a time travel series that has already explored the distant future and the actual past, do to make a third installment? Legacy of Time’s team struck gold with the idea to investigate mythological locations as if they were real places. El Dorado, Shangri-La, and Atlantis provided players yet another new way to experience the magic of time travel. If the developers decided to just do another game that took you to a completely made up place in the future or a verified point in the historical record, it would have been an easy out for them. They took a creative leap by incorporating fictional cities into the series; it combines the historical accuracy challenges of Buried In Time’s locations while still granting them a hefty amount of artistic license similar to what they had for the first game. The surge of revenue that came from the success of Buried In Time also allowed the development team to take more risks, such as adding the ability to interact with NPCs. In previous games, with the exception of certain instances, you would immediately lose the game if you encountered someone from past. The addition of a “chameleon” function allowed Gage to now assume the form of anyone whose likeness he captured. This opened up the series to having dialogue, and not just with Arthur. You can learn about Buddhism while impersonating Genghis Khan! Truly a revolutionary moment in gaming history. This was a big deal for the series, as it was a radical departure from the gameplay people expected from the franchise, and it forced the game designers to come up with new dialogue systems and ways to incorporate a ton of full motion video. Having the chameleon ability made me feel like a high tech spy, donning disguises to extract information and infiltrate heavily defended areas. While the acting and writing were... uneven at times, it was a brand new and welcomed turn for the franchise, making time travel fresh and exciting for what turned out to be one last time. I’ll be honest, this is one of my favorite series from my youth. Back to the Future gave me the time travel bug, and when the first game came out, I was at the right age to get into it. Not only did it entertain me, it also inspired an appreciation of religious studies when it incorporated some of the basic tenets of Buddhism in Legacy of Time. In retrospect, it’s kind of amazing to see a video game series not only make drastic changes to its formula, but to see it consistently happen with each release. So few games nowadays are willing to take these kinds of risks, and it was really admirable that the team at Presto Studios put in the effort to keep the series fresh. They went back in time, but they didn’t repeat the past.